Abdallah is one of the most well Known Saudi writers outside Saudi Arabi ,born in the fifties he studied Arabic literature in his native Saudi ,he then lived in the us ,and has been an editor of a number of magazines around the world involving Arabic culture .He currently lives in london and is editor of the quarterly magazine Al Thaqafiyah . 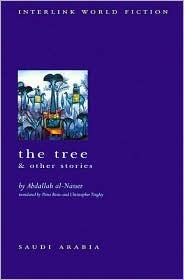 The tree is a collection of short stories ,mainly based in Saudi ,but others are based in Scotland and US ,now these stories do what great Arabic short fiction does and that is show life ,like a fly caught in amber catching a unique moment or series of events perfectly .The main story the tree is a clever story about old and new clashing and what happens when people stick to closely to tradition.A new hospital was due to be built but an old village tree was in the way ,so it was built elsewhere. A year later , the people were passing by the tree on their way to the hospital .One thing had certainly got bigger – the graveyard to the west of the tree .In time the tree was standing in the middle of the graveyard . the closing lines of the title story the tree . Abdallah has a great wit ,and a natural talent for satire.It also captures the clash of cultures in Saudi the old and new and how they sit and sometimes smash into one another . elsewhere we see a man discovering the in workings of a factory ,people’s disappointments at what there doing and what they could do .There is a story set in Loch Ness about a couple of people who meet one dark night in that spooky place .The book itself is short at only a hundred and twenty pages .There are over twenty stories so it is a book that can easily be read in an evening like I did .Like other short stories from Arabic world I ve read in the last year or so ,these stick with you and make you think of a different world to my own . Do you like short stories from Arabic ? Have you a favourite Arabic writer ?